Special family dinners are the perfect opportunity to try out a new recipe. 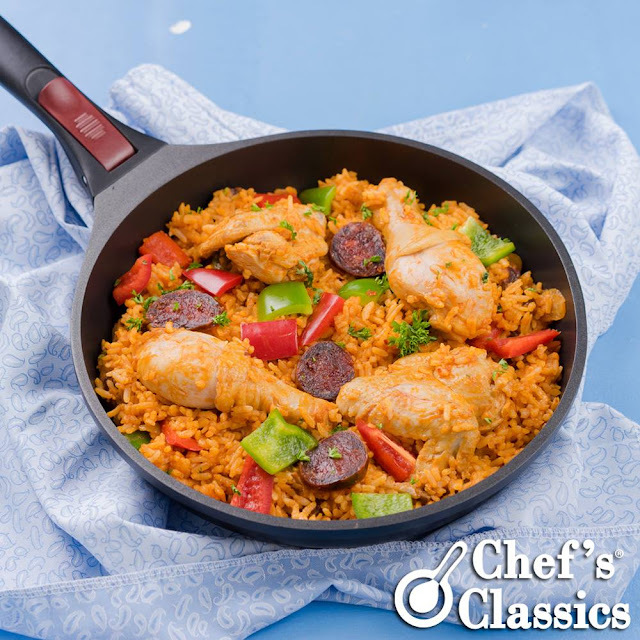 Try serving the Chicken and Chorizo Jambalaya tonight. 1. Heat Chef's Classics Caper Detachable Frypan. Add in olive oil, garlic and onion. 2. Saute for 3 minutes or until onion caramelizes and changes color. Add in tomato paste, chicken and bell peppers. Cook for another five minutes. 3. Stir in rice and chicken stock. Bring to boil and then simmer until rice is cooked. 4. Add the chorizo, and half of the parsley. 5. Simmer for 5 more minutes, until the chicken is cooked with no pink remaining. 6. You may reheat inside the oven before serving for 3 minutes. Just remove frypan's handle and serve hot!